A PC PSU has three main voltages: 3.3, 5, and 12. In a perfect world, the PSU would have three separate sets of circuitry and transformers so each voltage could be carefully controlled independent of the other two. But this is a PC PSU so you have to get by with something less expensive. In most PC supplies there is only one set rather than three so it only has one main regulator and one main transformer. The main transformer has two outputs: one for 5 volts and one for 12. 3.3 volts is actually created by taking the 5 volt output and regulating it down to 3.3 volts. The PSU's primary means of controlling the 5 and 12 volt outputs involves adjusting the size of power pulses going to the main transformer. When it tries to adjust one of the voltages it also affects the other voltage. If the two voltages had their own transformers and circuits then it wouldn't happen, but they have to share only one. In single tranformer PSUs, the two voltages are closest to their correct values when their loads are balanced. But if one voltage is heavily loaded and the other is lightly loaded then sharing that transformer causes problems. Because it can't regulate the voltages independently, the more heavily loaded voltage is too low and the more lightly loaded voltage is too high. If the two loads get too unbalanced then the voltages can get far enough out of their desired range that the power supply has to turn off to avoid causing serious problems. 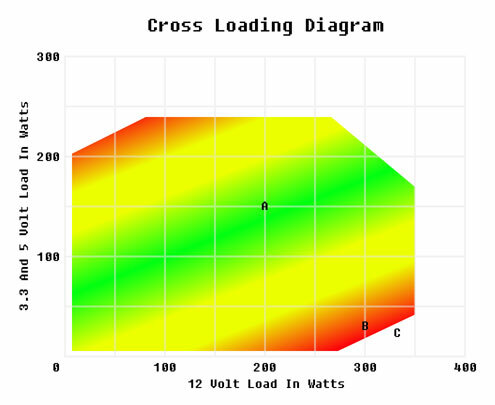 The subject of relative loads on different voltages is called cross loading. There are ways to improve the single main transformer PSU design to reduce it's cross loading problems. Of course, they cost more money so PSUs makers put varying amounts of effort into it. Most power supplies have pretty good cross loading characteristics when used with the kinds of computers for which they were designed but many PSUs don't. Older computers draw most of their power from 5 volts and newer computers draw most of it from 12. The voltages are worst when the loads are unbalanced but the PSU designer can adjust the circuits in the PSU to support whatever balance is needed. So older PSUs were designed to regulate voltages best when most of the load was on 5 volts. New PSUs like ATX12V 2.0 models are designed to work best when most of the load is on 12 volts. But suppose you take an older ATX PSU and put it in a new computer. Even if the old PSU has enough 12 volt current for the new computer you may still have cross loading problems. That's because the old PSU's ideal load balance was most of the load on the 5 volt rail. Putting an old PSU in a new computer may strain the PSU's ability to handle what it considers to be an unbalanced load. That old PSU will have to have excellent cross loading characteristics to be able to maintain accurate voltages. The same problem occurs if you have an old computer and use a newer ATX12V 2.0 PSU which is balanced for most of the load on 12 volts. It pays to be careful when selecting your PSU. Older computers have less problems with power supplies designed for older standards like ATX12V 1.3. Newer computers are better off with PSUs designed for newer standards like ATX12V 2.0 and later. There are some PSUs which dedicate some extra hardware to independently adjust their voltages and don't suffer from cross loading problems at all. You can stick them into both old and new computers without worrying about load balancing. You just have to make sure they provide enough current for each voltage. The diagram above is a simplified version of a cross loading graph. It shows the quality of voltage regulation for all supported combinations of loads on 5 and 12 volts. Red means the voltages are poorly regulated, yellow means they're just okay, and green means they're good. The area outside of the colored zone is for wattage combinations not supported by the PSU. It may be unsupported because the current is outside of the PSU's limits or because that wattage combination results in voltages which are outside the legal range specified by the ATX spec. For example, point A shows you that the voltages are good when 12 volts is drawing 200 watts and 5/3.3 is drawing 150 watts. Point B shows you that the voltages are pretty bad when 12 volts is drawing 300 watts and 5/3.3 is drawing 30 watts. Point C shows you that the PSU can't deliver legal voltages when 12 volts is 330 watts and 5/3.3 is 25 watts. Since PC PSU manufacturers tend to publish sketchy specs, they rarely publish this cross loading information. Fortunately there are some folks at X-Bit labs who do a very thorough job of testing power supplies. You can find lots of power supply comparisons here. You can see the cross loading graph of a decent supply for this SilverStone Zeus ST65ZF. For that PSU, you need to load the 5/3.3 rail with at least 25 watts to be able to safely push the 12 volt rails to their maximum wattage. It takes closer to 50 watts on 5/3.3 to get all rails in pretty good shape. There are other power supplies like this OCZ Modstream 520 which are much pickier about unbalanced loads. If you don't keep its rails loaded within a fairly narrow range then you've got problems. Both the OCZ PowerStream and Antec TruePower lines of PSUs add extra hardware to make their outputs independently adjustable despite still only having one main transformer. They both have excellent cross loading characteristics. You don't have to worry about cross loading in those PSUs at all. There are others which also support independent adjustment of voltages but it may be difficult to work it out from the marketing descriptions. If it says "independently regulated voltages" then that usually is a good sign. Even a PSU which is picky about crossloading will work just fine within a more narrow range of loads. This PSU will deliver acceptable voltages with 12 volts at 200 watts and 5 volts at 125 watts. It just has a narrower range of power combinations which result in acceptable voltages. That kind of PSU can be more troublesome because the loads on a PSU's rails jump around a lot depending on what the computer is doing. It's not just one point on the diagram; it's a whole area of possible wattage combinations which the computer will require at various times. That's why it's best to avoid power supplies which are picky about cross loading. Severe cross loading problems can cause a PSU to turn off when the load changes. Less serious cross loading can just result in voltages which are outside the legal range and cause crashes and hangs. You may be able to see cross loading problems by monitoring the voltages on the motherboard with voltage monitoring software or a voltmeter but they can't see sudden voltage changes. Current consumption is definitely not flat when a device is running. It rises and falls very quickly depending on exactly what the device is doing and so the voltages can bounce around very quickly. That makes the quick loading changes difficult to observe unless you have high speed equipment. But you can observe some cross loading problems with voltage monitoring software. For example, current video cards and CPUs draw most of their power from 12 volts. When you start a 3D game, the load on the 12 volt rail rises a lot but the load on 5 volts stays pretty flat. If you see the 12 volt rail drop a lot or the 5 volt rail rise a lot when you start a 3D game, then your PSU is having cross loading problems. The ATX specification says that the 5 and 12 volt rails are supposed to be accurate within 5%. If your voltages go outside that range then your machine can get flakey. The best way to deal with cross loading problems it to buy a supply which doesn't have them in the first place. But if you can't get a new PSU then you may be able to reduce cross loading problems by reducing the wattage imbalance in the computer. You can either reduce the wattage on the overloaded rail or increase the wattage on the underloaded rail. Neither of those options is particularly convenient. A common case you may run into is when you replace an old motherboard and video card but keep the rest of your computer the same. If your old setup drew a good portion of its wattage from 5 volts then your power supply will probably be balanced that way. If your new setup draws most of its power from 12 volts then your old power supply may give worse voltages because its 5 volt rail is underloaded. Many newer motherboard and video card combinations draw very little power from 3.3 and 5 volts. Quite often the total load on 3.3 and 5 volts is less than 25 watts even when the machine is running at maximum load. You can either buy a new PSU or try to increase the load on 3.3/5. Unfortunately, not that many add-on devices draw much power from 5 or 3.3 volts. Disk drives usually draw less than 5 watts from the 5 volt rail when idling and some newer hard disks are powered by 12 volts only. RAM is powered from the 3.3 or 5 volt rail and its power consumption varies quite a bit depending on size and speed but is usually less than 10 watts per memory stick. There is the brute force approach of connecting a power resistor to the 5 volt rail but it may take quite a few or a really big one to get the job done. And they get very hot! You can make your own using an old peripheral power cable and cheap cement resistors from Fry's or Radio Shack if you're good with a soldering iron. But it's not exactly an elegant solution. The best solution is to get a power supply which doesn't have cross loading problems in the first place. Or at least get one whose load balance has been set up for your kind of computer. It's easy to check in those reviews on X-Bit labs. Keep in mind that you don't often see cross loading problems unless you've got a seriously unbalanced load or if you have a crummy power supply. Having the machine turn off unexpectedly or crash can be a symptom of many problems. Your first guess should not be to blame crossloading. It's pretty uncommon.